The parts within an entity system can also form a containing hierarchy. Examples are organs in a body and departments of an organisation. One needs to distinguish between an entity system and its parts. Some of the parts of an entity system are its functions (i.e. activity systems), others are associated structures (e.g. limbs and bones of the motor and skeletal functions of the body; project teams in an organisation), emerging structures (e.g. a tumor in the body or a clique in an organisation). Other parts are cross-functional structures which are incomplete entity systems (e.g. the organs of a body, some types of business units of an organisation). Unlike the entity system as a whole, a part in isolation cannot maintain itself. It cannot have an independent existence or survive on its own without the resources of the entity system of which it is part. The part exists as long as the entity system of which it is a part exists. For example, the heart lives as long as the body does; as does a function in an organisation. In the sociosphere, however, a part can choose to become an entity system in its own right (e.g. an outsourced marketing department becomes a marketing organisation; a project team starts its own business). The parts of an entity system are occupied and enlivened by entity systems from the inner environment. For example, the cells enact the functions of the organism. Likewise, persons occupy the functions and parts of an organisation. The containing entity system and its parts tend to outlive the occupying entity systems. For example, the organism and its functions outlive the cells which are continuously renewed. Likewise, persons within an organisation come and go. Unlike systems in the naturosphere, a social entity system can determine its own parts and number of levels. 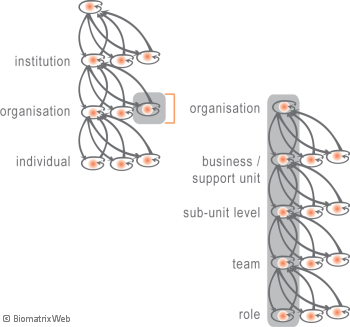 For example, the number of business and functional units of an organisation can vary, as does the number of levels in its organisational hierarchy. The function is an inherent part of the organisation, the person occupying it is not. Organisation development (OD) focuses on the function, human resource development (HR) focuses on the person occupying the function.